The mission of the health services department is to provide care for students, under direction of their specific provider. As well as care for minor injuries that occur while they are at school. We educate on puberty for 6th grade, CPR for faculty and students, and do yearly vision screenings. We also hold immunization clinics for childhood vaccines and flu vaccines at specific times of the year. Our goal is to keep our students in tip top shape so that they can simply focus on their studies and extra curricular activities, without worrying about illness. I started my education at the Pontotoc Technology Center, where I obtained my LPN certification, in 2013. I worked for Mercy, mainly in Pediatrics and OB/GYN, before starting with Ada City Schools in 2016 as the LPN. 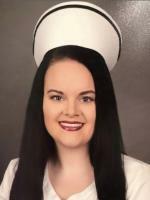 I continued my education at Murray State College where I received my Associates in Applied Science and was able to sit for the RN exam. I am now in my third school year with Ada City Schools and my first year as the RN. I love my job and I love taking care of the kiddos in the best school district!! I am the LPN for Ada City Schools. I grew up in Dallas, but moved to Roff when I was in high school and became a cheerleader there. I graduated in 2006, married my high school sweetheart in July, and went straight on to nursing school. I graduated from the Vo-Tech in June of 2007 and started my nursing career as an OB nurse. I've worked for the Chickasaw Nation, several nursing agencies, Mercy, and now Ada Schools! I have two children myself, so I am very passionate and excited about taking care of the kiddos in a great school district!